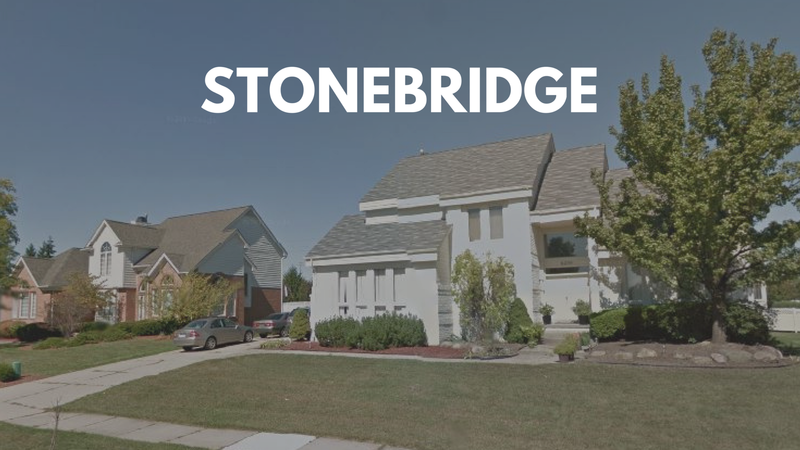 Stonebridge is a subdivision in West Bloomfield, Michigan located south off W. Maple Rd. This elegant subdivision between Farmington Rd and Drake Rd., features large brick homes with 4-5 bedrooms and 2+ bathrooms. Most homes are contemporary or colonial in style and architecture with 2-3 car garages and basements. Homes were built between 1989 and 1993 and are priced from $400,000 – $525,000. Homeowner’s association dues are about $550 per year and include community maintenance and management. Take a tour through this community and you’ll find drive-through driveways, mature landscaping, larger lots, and sidewalk-lined streets. Stonebridge is part of the West Bloomfield School District as is served by Doherty Elementary for grades K-2, Shieko Elementary for grades 3-5, the Orchard Lake Middle School, and the West Bloomfield High School. Shops, markets, and restaurants are located just 5 minutes outside the subdivision at the intersection of Drake and Maple or to the east on Farmington and Maple. The Drake Sports Park is just a mile away and offers 5 tennis courts, a skate park, lighted softball fields, pickleball courts, soccer fields, ADA playgrounds, a pavilion and walking trails. The Henry Ford Medical Center is less than a mile and a half away as well as the Marvin & Betty Danto Health Care Center and several clinics and medical facilities. Also close by is the Adventure Park at West Bloomfield with zip-lining and a complete aerial forest adventure. This park is seasonal and typically opens around May each year, just in time for summer. I’d love to personally show you any home for sale in Stonebridge or surrounding communities. Feel free to browse any listings for sale and contact my office anytime to schedule a showing.